It’s our anniversary! Our second one, but Mondays are boring and also our laundry day, and for some reason I was awake at 4:00 this morning, so to celebrate we did a load of towels, had a nap, and Nick brought me orange flowers, and we went for sushi, which was delicious, though convenient. But last night I wanted to do something kind of special, because we spent our first anniversary pushing Paul’s car across the border, which was as romantic as pushing a Honda Civic across the Canadian border in the dark and then standing under an orange street light for an hour waiting for a tow truck on the other side in November after frost has fallen and taking public transit back to the city can be. To make up for last year, this year I brought my A-game. Sometimes I like making food that takes all day, and I wanted to do something distinct to mark Sunday as separate from the rest of the weekend, during which we also celebrated Nick’s birthday. I invited Grace and Paul over to celebrate our anniversary with us, and we had so much food. Come to think of it, it makes sense now that I was up at 4:00 a.m.; there is only so much pork that one can cram into her maw and still expect to sleep through the night. 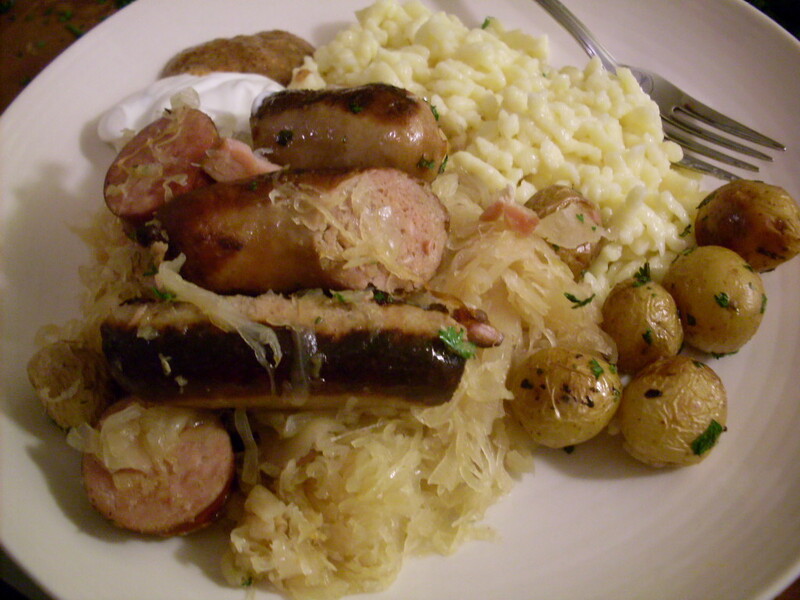 The recipe that follows is based on Jeffrey Steingarten’s recipe for Choucroute Garnie à L’Alsacienne, from his book The Man Who Ate Everything. 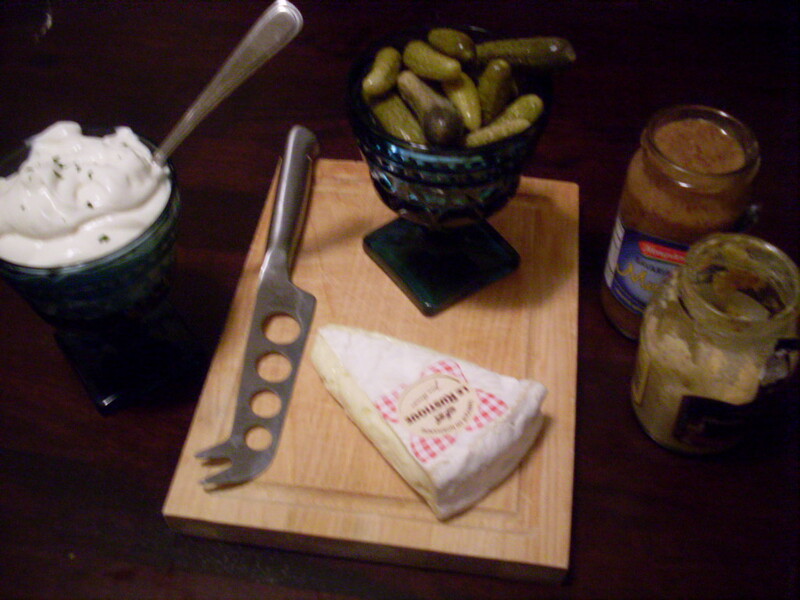 Because I am paid considerably less than Mr. Steingarten and am routinely accosted by Nick over how much I spend on special-occasion meals (not much, by the way, but he feels that all the dollars I spend on fancy ingredients could be spent far more enjoyably on beer), there are some adjustments. Much as it saddens me, I simply do not have an elaborate collection of specialty meats on hand. One day. Perhaps with the next husband? Place pig’s feet in a medium-size pot, and cover with water to about an inch above the feet. Simmer for one hour, then remove feet, and reduce until about two cups remain, an additional 15 minutes. Set aside. Drain sauerkraut in a large strainer, squeezing out liquid periodically. Rinse, then continue to drain, about an hour. Cook all three sausages and bacon. Set aside. Simmer gin in a small pot until reduced by about two thirds. Set aside. In a large, heavy bottomed pot over medium heat, melt butter, then cook onions until softened but not golden, about ten minutes. Add apples and sauerkraut. Stir to combine. Add gin reduction and bay leaves. Add reserved stock, and Riesling, and two cups of cold water. In a piece of twice- or thrice-folded cheesecloth, combine peppercorns, caraway, cloves, thyme, and parsley. Tie tightly with kitchen twine and let sit in sauerkraut mixture. Place meat on top of mixture, then scatter garlic over top, and then sprinkle salt over top. Bring to a boil, then reduce to medium low. Cover, and simmer for 90 minutes, stirring approximately every 20 minutes. Preheat oven to 250°F. 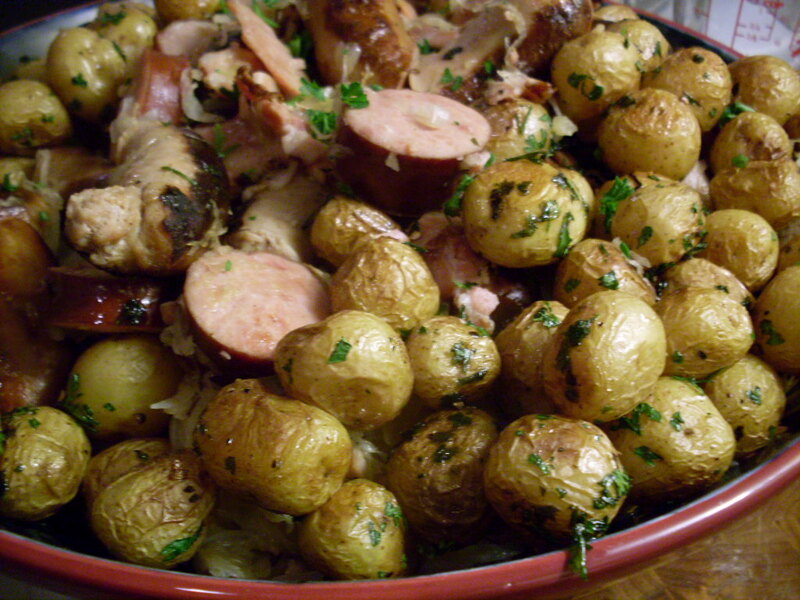 When choucroute has finished cooking, remove meat to a plate and let rest, covered in tin foil, in a warm oven. Let choucroute rest, covered and off the heat, for 30 minutes. 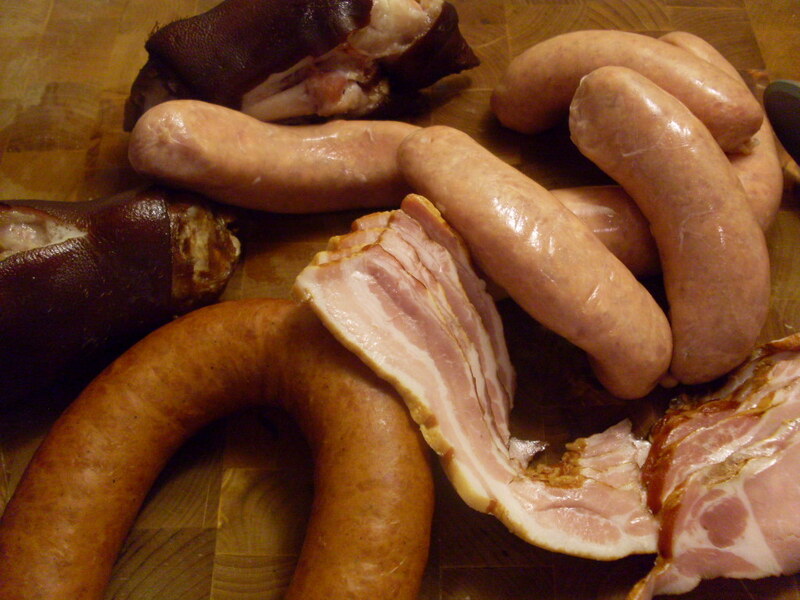 To serve, drain choucroute and place in the centre of a platter. 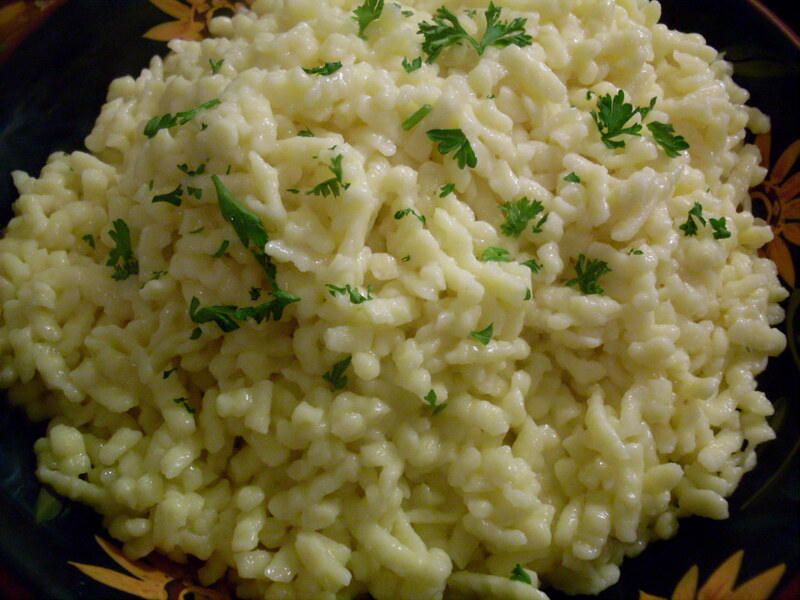 Place meat on top, and scatter side dishes around, such as spaetzle or fried potatoes. Serve with sweet mustard, sour cream, and cornichons. To eat, ensure you are wearing something with an elastic waistband. < Previous Coq au Riesling. Next > Tamale pie with black beans and red peppers. I love love love choucroute! Your platter looks amazing… it’s just make me so hungry 🙂 Thanks for sharing! Happy Anniversary! Those pictures look so yummy I’m drooling into my breakfast of apple and water (not a self-imposed dietary constriction, was too lazy to get up for breaky this morning and now too cold out to run down and grab a bagel, excuses, excuses). You’ve got one lucky husband! Holy cow…or maybe pig? That looks amazing. And congratulations on 2 years married! I want to make this, yes I do. Wonderful! Happy anniversary, you two, and it sounds like one very well spent. I love the “pushing the car over the border” story… it’s that kind of bonding experience that comprises a good omen, I think. 🙂 (But then, since I had a flat tire on the way to my wedding, I sorta have to think so… hasn’t hurt us, anyway!) Sending HUGS! Thanks for the congrats, Lima, Rootie, and Linda!